The owner of Tim Hortons and Burger King has reached a deal to add fried chicken chain Popeyes to its stable of quick-serve restaurants, in a deal worth $1.8 billion. The owner of Tim Hortons and Burger King has reached a deal to add fried chicken chain Popeyes to its stable of quick-serve restaurants, in a deal worth $1.8 billion US. Restaurant Brands International has agreed to buy Nasdaq-listed Popeyes Louisiana Kitchen, Inc. for $79 a share. The Atlanta-based chicken chain has 2,600 locations worldwide. Restaurant Brands owns more than 20,000 restaurants around the world, and has been based in Oakville, Ont., since its controlling shareholder, Brazilian investment firm 3G Capital, purchased Tim Hortons and created the company in 2014. For comparison purposes, McDonald's had 36,800 locations around the world at the end of last year. Yum Brands — which owns KFC, Pizza Hut and Taco Bell — has more than 43,600. Since that deal, Restaurant Brands has increased the footprint of both chains, striking deals with local operators to open additional Burger Kings around the world and expand Tim Hortons in the U.S., England and the Phillipines. More of the same is expected now of Popeyes, should the deal close. "As Popeyes becomes part of the RBI family, we believe we can deliver growth and opportunities for all of our stakeholders including our valued employees and franchisees," CEO Daniel Schwartz said. "We look forward to taking an already very strong brand, and accelerating its pace of growth and opening new restaurants in the U.S. and around the world." Popeyes was especially coveted by Restaurant Brands because — unlike some other fast food chains — the company derives most of its money not from food sales, but rather from the fees it collects from franchisees. That's because 97 per cent of Popeyes restaurants are franchised, Bloomberg analyst Jennifer Bartashus said. "The addition of a chicken-based chain may help Restaurant Brands compete more aggressively against Yum Brands' Kentucky Fried Chicken," Bartashus said, "and may help Popeyes accelerate new store development plans and catch up to peers in customer-facing technology." 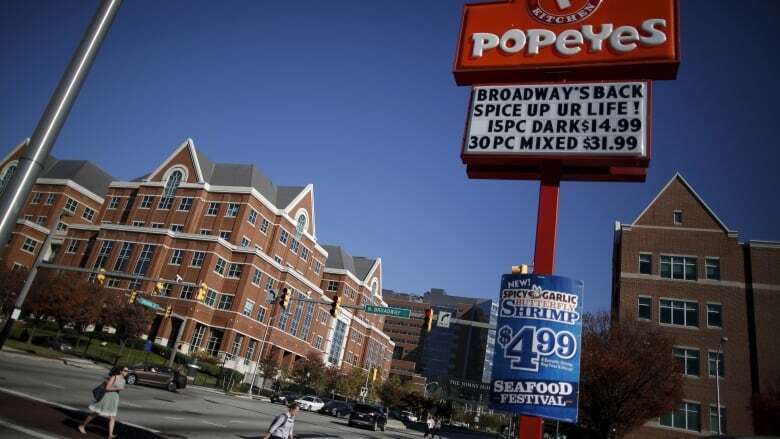 The Popeyes deal had been rumoured for several weeks, and the purchase price represents a 27 per cent premium to where shares for the fried chicken chain were before the rumours started.